Woodstock Little League offers the opportunity for all children ages 4 through 18 to play baseball, learn about sportsmanship and fair play and build new friendships. We are excited about the quality of volunteers we have each year who share a common purpose to provide a positive experience for all those who just want to play baseball and softball. Woodstock Little League's 2019 Opening Day will be held at Roseland Park on Saturday, April 27th. There will be free coffee/dontus, 50/50 raffles and food/beverages available at the concession stands. The Opening Day ceremony will start at 9:00am. We ask that all players and coaches dress in uniform and meet on the softball field at 8:45am for a short parade/introduction, followed by a brief ceremony on the main baseball field. Uniforms should be in by the end of next week. Uniforms will be given to the coaches who will then hand them out at practice. All Woodstock teams are scheduled to play games on Opening Day. Please see the schedule below for your game times and location. This Spring, our league fundraiser will be a Spring Drawing. Tickets will be available from your team manager beginning on Opening Day. Tickets will be $5 each and each player that did not buyout during the registration process will be required to sell at least five tickets. If your player bought out of the fundraiser during the registration process, they essentially bought five tickets, so please fill out five ticket stubs and return to your team Manager. Each player, including those who bought out of the fundraiser, can sell as many tickets as able. Additional tickets can be obtained from your team manager. The players that sell the most tickets will be able to choose (1) prize from the list below based on their standings*. *Players must sell a minimum of 20 tickets to be eligible for above prizes. Players and parents are asked to turn in all ticket sales (stubs and money) to their team Manager by June 5, 2019. The top sellers and ticket drawing winners will be announced at the Closing Ceremony scheduled for June 15, 2019. WLL appreciates everyone’s efforts in making this a successful fundraiser for our league. Any questions can be directed to WLL’s Fundraising Director, Pat O’Brien, at or by text 860-208-9913. Online registration is open for Woodstock Little League's Junior Baseball program. Q: What is Junior Baseball? A: Junior Baseball is comprised of players Little League ages 13 through 15. Q: How long is the Junior Baseball season? A: The Junior league season will begin in late May at the conclusion of the school seasons, and end at the end of June or early July. Q: How often and where are Junior Baseball games played? A: Teams generally play 2-3 games per week. Home games will be played either at the Woodstock Middle School fields or at the Bentley complex fields. Q: Are Junior League teams/players eligible for All Stars? A: The Junior division does have an All Star tournament that begins in mid to late July. To be eligible for Tournament play, teams must have scheduled and played at least 12 Regular Season Games, and players must have participated in 60% of their team's Regular Season Games. Q: Will my player's team be comprised of only Woodstock residents? A: While our goal is to field teams consisting of only Woodstock players, low registrations can force us to combine with surrounding towns like Putnam, Pomfret, Brooklyn, Thompson, Killingly, etc. in order to field a full team. Please check our website for additional details and to register online. Click on "Woodstock Little League"
*Please be sure to write your Confirmation# on your order form, along with your player's first and last name. Bring your order form to Picture Night and have your child give to the photographer when it is their turn to take their picture. Once again for the 2019 season, WLL will be offering sponsorship banners to be placed on the outfield fences of our main baseball and softball fields. With a donation of $250 or more, a banner displaying your business or family name, logo and contact information will be placed on our new outfield fence screens for the entire 2019 season (April 2019 through October 2019). Please see the attached Sponsor Registration Form for more details and instructions. WLL would like to ask that you please consider participating in this new and exciting fundraiser for our league, or please send to businesses, families and friends that you think may be interested. 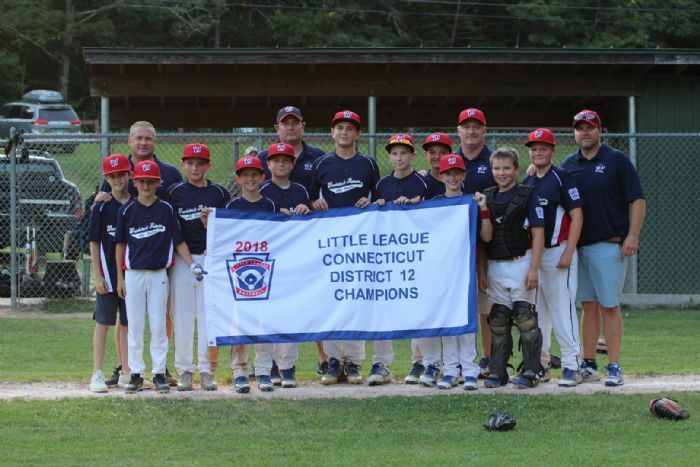 Woodstock Little League enjoyed quite the post-season run this past summer! 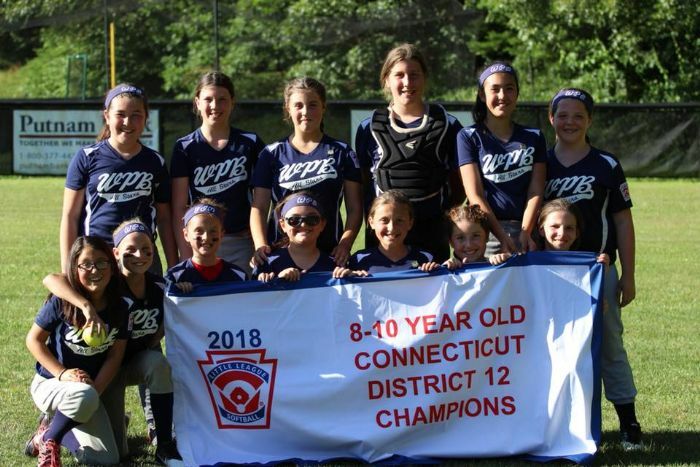 On Saturday July 7, 2018 the 8-10 year old Woodstock/Pomfret/Brooklyn Softball All-Star team beat Mansfield/Ashford 17-0 to win the District 12 title. Overall, the girls went 4-0 in the District 12 tournament, outscoring opponents 62-5. The girls then played in the State Sectionals (Section 4) at the Stafford LL Complex. WPB's lost both games in the Sectionals, dropping a 10-6 decision against District 11 champion Jewett City/Preston and suffering a 7-2 loss to District 8 champion Windsor. WPB played valiantly in both losses, tied 5-5 against JC/Preston entering the final inning and only down 3-2 against Windsor entering the last inning before losing. Overall, the girls finished 4-2 in All-Star play, winning the District 12 championship and finishing top twelve in the State of Connecticut. On Sunday July 8, 2018 the 8-10 year old Woodstock Baseball All-Star team beat Stafford 11-4 to win the District 12 title. Overall, the boys went 3-1 in the District 12 tournament. Emerging pool play as the fourth and final seed, the boys took down the top-seeded Pomfret/Eastford team 17-3 in the semifinals before beating Stafford for the title. The boys then played in the State Sectionals (Section 4), which was held at the Willimantic Legion Field (54 Quercus Ave, Willimantic, CT). Woodstock dropped both sectional games, losing 13-3 against District 11 champion Jewett City on Friday 7/13 and losing 14-2 against District 8 champion Ellington on Sunday 7/15. Overall, the boys finished 3-3 in All-Star play, winning the District 12 championship and finishing top twelve in the State of Connecticut. 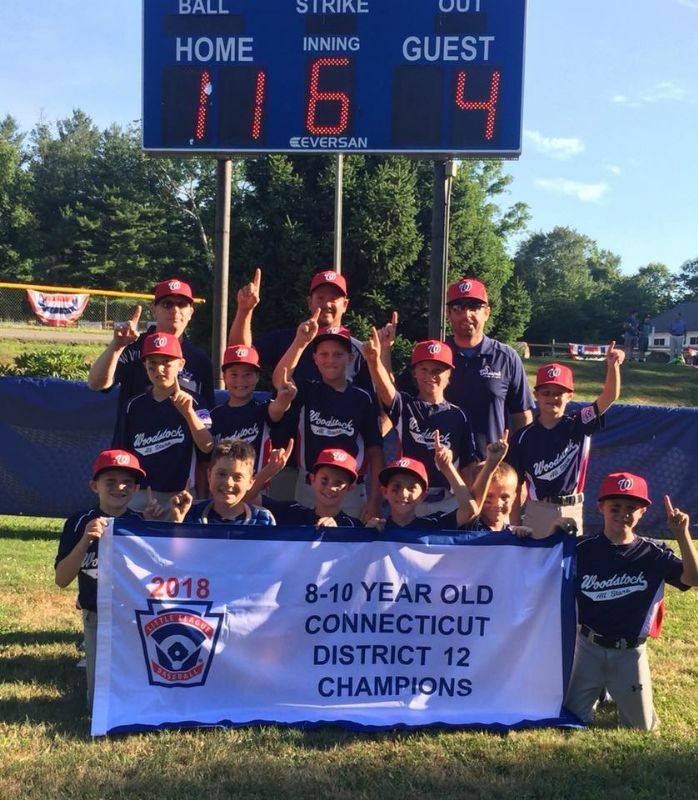 On Friday July 13, 2018 the 10-12 year old Woodstock/Putnam All-Stars defeated Brooklyn 15-5 to win the District 12 title. Overall, the boys finished 6-0 in the District 12 tournament. The boys advanced to the State Sectional tournament, which was held at Brookside Park in Ellington. The boys opened up Sectional play on Wednesday July 18th with a 4-2 win over District 8 champion Manchester National, followed by a 5-0 vistory over District 11 champion Moosup/Plainfield on Thursday July 19th. Unfortunately, the boys lost 5-1 in the State Section 4 championship game to Manchester National on Saturday July 21st, and were eliminated from tournament play. The team finished its All-Star run with a record of 8-1, and finished in the top eight in the State of Connecticut. The final tally was three District 12 championship banners for WLL this magical tournament season. Congratulations to all of the players and coaches! All board meeting are open to the public. The league is always looking to get parents and friends of Woodstock Little League involved in ways that make us stronger, and ultimately improve our children's experience. Without our volunteers, the organization cannot thrive. Please consider attending meetings or joining the board.